Kyra Santoro has the Latin words “alis volat propriis” inked on the back of her neck. 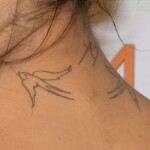 In English, the phrase translates to “she flies with her own wings.” This was her first tattoo that she had done when she was 17. Liane V has two lines of writing tattooed on the right side of her rib cage. 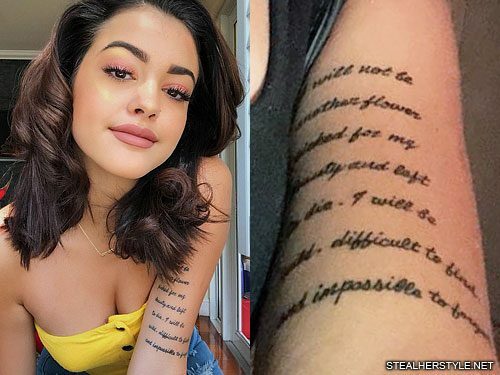 Malu Trevejo got her biggest tattoo yet in February 2018 — and of course she livestreamed the whole process. 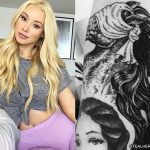 The 15-year-old social media star got seven lines of text on her upper left arm featuring a poem by Erin Van Vuren. 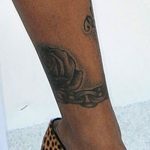 Her tattoo says: “I will not be / another flower / picked for my / beauty and left / to die. I will be / wild, difficult to find, / and impossible to forget.” It’s about wanting to be more than just a pretty face and wanting to have a real impact on people. We are all going, I thought, and it applies to turtles and turtlenecks, Alaska the girl and Alaska the place, because nothing can last, not even the earth itself. The Buddha said that suffering was caused by desire, we’d learned, and that the cessation of desire meant the cessation of suffering. When you stopped wishing things wouldn’t fall apart, you’d stop suffering when they did. It is about accepting that we cannot change our own mortality and the impermanence of everything and everyone around us. 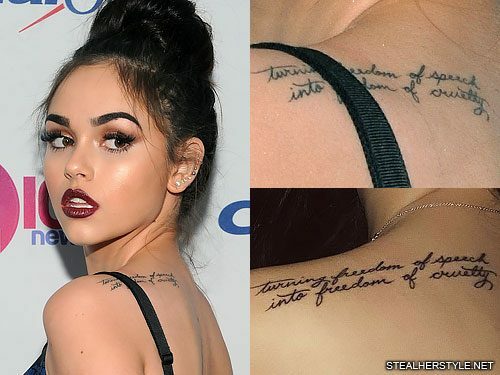 Maggie Lindemann has a quote in a script font on her upper back from the poem “Troll” by author Shane Koyczan. It says “turning freedom of speech into freedom of cruelty.” The poem is about how internet trolls are extremely harmful to their victims and trolling is not a game. When Maggie was going through dark times, Shane Koyczan’s poems hit home. 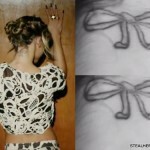 They resonated with her so much that she’s had two of them tattooed — the first is on her arm. 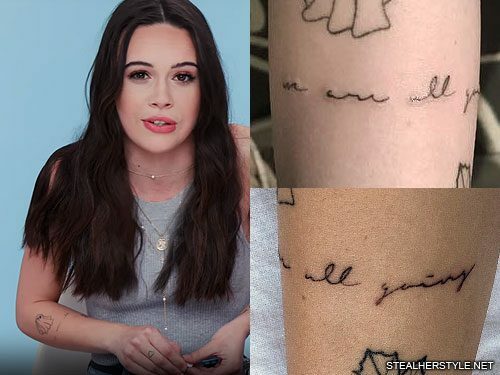 She got this tattoo in December 2016 from her favorite artist Romeo Lacoste, who does all of his cursive tattoos in his own handwriting. “Thank you @romeolacoste for always being the best at what you do,” Maggie wrote on her Instagram. 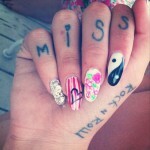 Jaira Burns has the message “if there is no struggle there is no progress” inked in cursive font on her right ribcage. 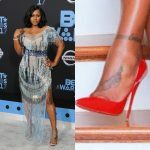 Jessica Shears has many tattoos on her body and this quote on her ribcage which reads: “It’s never too late to be what you could have been” is very inspiring. Melissa Satta has a tattoo on her foot reading “In life every ending is just a new beginning”. Melissa Satta has an italian quote inked on her right forearm. 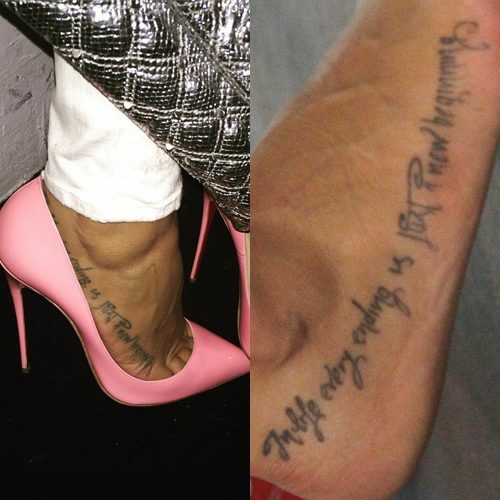 Her tattoo says “L’amore è Libertà… Non è possesso” and it translates to “Love is Freedom, not ownership”.